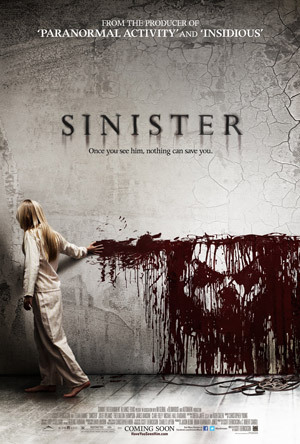 Sinister DVD and Blu-ray Details. Ethan Hawke, Juliet Rylance and Vincent D’Onofrio star in the supernatural horror thriller. See the special features and movie trailer for Sinister below. From the producer of the Paranormal Activity films and the writer-director of The Exorcism of Emily Rose. A true crime novelist discovers a box of mysterious, disturbing home movies that plunge his family into a nightmarish experience of supernatural horror. A true crime novelist struggling to find his next big story moves his family into a house where the horrific murder of an entire family took place. But after finding a box of home videos in which other families are also brutally murdered, his investigation leads him to a supernatural entity that may be placing his own family in harm’s way.